Home › National Bird of India › Swamp francolin › Tibetan partridge - Perdix hodgsoniae. The Tibetan partridge (Perdix hodgsoniae) is a gamebird. The Tibetan partridge belongs to the pheasant family Phasianidae. These birds are distributed in Pakistan, India, Nepal, Sikkim, Bhutan and China. There are three recognized subspecies of these partridges. The subspecies P. h. sifanica occurs in China. The subspecies P. h. caraganae occurs in Nepal, India, Tibet and Bhutan. The subspecies P. h. hodgsoniae occurs in Nepal, India, Tibet and Bhutan. The International Union for Conservation of Nature (IUCN) has categorized and evaluated these bird species and has listed them as of "least concern". These partridges are small birds measuring 25 to 30 cm in length and weigh 300 to 450 grams. The male partridge is slightly brighter and larger than the female. The face and throat are white. A broad black stripe run down the down the face near the eyes. The hind neck collar is chestnut. Broad chestnut bars are seen on the flanks. These partridge inhabit mountain slopes and scrub cover. They are found between 3600 m and 5600 m elevations. In winter they move to lower elevations. These birds are monogamous and breed during March to June. Distribution: Pakistan, India, Nepal, Sikkim, Bhutan and western China. 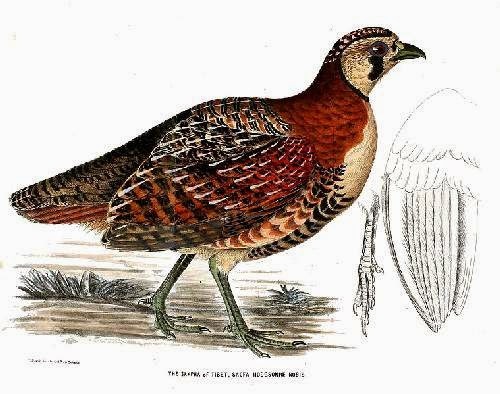 Current topic in Birds of India: Tibetan partridge - Perdix hodgsoniae.